It’s probably an understatement to say that Irish-themed online slots are easy to find; you can see our top five by clicking here but we could easily have picked ten or more from this genre. Fans of this theme may well have played Nextgen Gaming’s Irish Eyes previously and this is the sequel. Unsurprisingly it’s called Irish Eyes 2 so read to find out if this is more of the same or if it offers anything a little different. 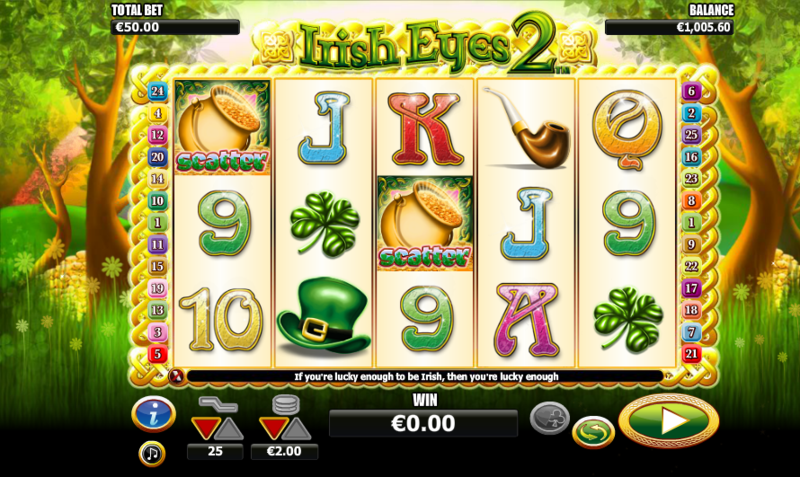 Irish Eyes 2 is a five reel slot with three rows and up to twenty five paylines; the backdrop to the reels is a faintly stylistic forest view with gently swaying shrubbery and a pulsating rainbow just about visible. A gold Celtic pattern surrounds the reels and a butterfly will occasionally flutter across the screen. There are four theme-related high value symbols – a four leaf clover, a pipe, a leprechaun’s hat and a gold ring. Lower values are made up with 9, 10, J, Q, K and A. The red-haired girl return from the previous game but this time she’s wild and worth 5000x your line stake for five on an active payline. The pot of gold represents the scatter symbol and also activates the main feature. During this round all wins will be subject to a 3x multiplier and the good news is that more spins can be re-triggered by landing three or more pots of gold again. Each win can be gambled by pressing the clubs/hearts button underneath the reels; try to double or quadruple that amount by guessing the correct colour or suit of the next card drawn. There’s a limit of five correct answers in a row. Take care with the gamble feature – it’s the speedy way to deplete your bankroll. We would advise avoiding it altogether. 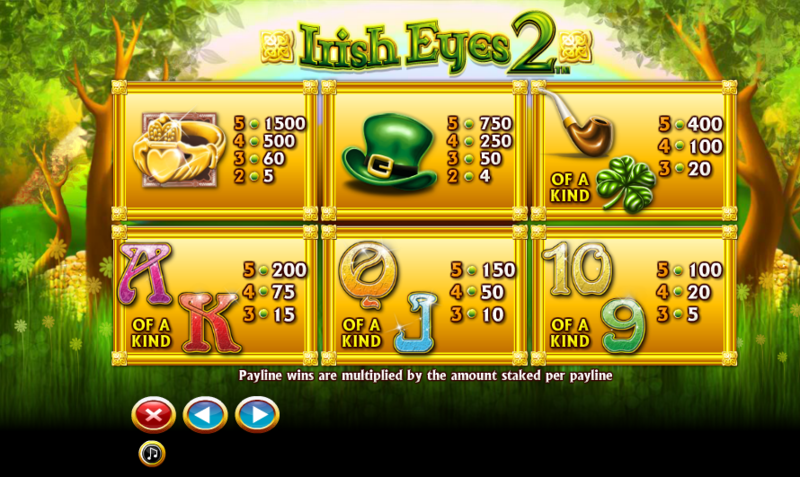 Irish Eyes 2 is certainly a graphical improvement on it’s predecessor but it lacks a bit in the creative department. Still, it does what it says on the tin so fans of this genre may enjoy it.